To support the competence of students, Undergraduate Program of Public Health Faculty of Health of Universitas Dian Nuswantoro (UDINUS) sent its students to industrial world. 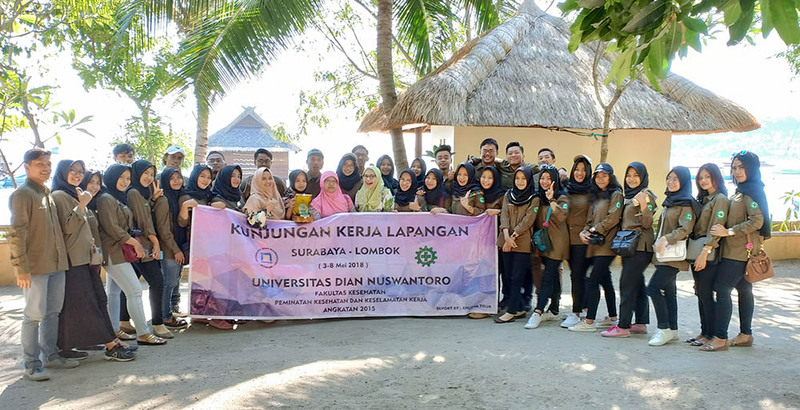 Recently, 36 students of 6th semester of Public Health Program with Occupational Health and Safety (OHS) major conducted a Field Work Visit (KKL) to East Java and Lombok. "The purpose of this activity is that the students can get a vision directly from the company, to acknowledge them the role and the work of an OHS graduate in managing safety in the workplace. The students are also expected to be able to implement the theories on campus at the work place, "said The Chairman of the Public Health Study Program, Dr. MG. Chess Yuantari, S.KM, M.Kes. KKL is a compulsory activity for students in 6th or 7th semester, but for OHS major, the KKL is conducted in 6th semester. The company that became the location of the activity was PT. Adhi Persada Beton Mojokerto, PT. Yakult Mojokerja in East Java and PT. Autore Pemberdayaan Mutiara in Lombok. The three companies were chosen because it has a good OHS operational, so that students can see directly the implementation of Management Risk and Emergency Response, SMK3, Industrial Toxicology, and Ergonomics courses. "After conducting KKL, students are required to make reports and present the results of their visits in the courses of Risk Management, Sanitation Hygiene, SMK3, and Industrial Toxicology. Because the KKL is an integration of several courses, "added Yuantari.